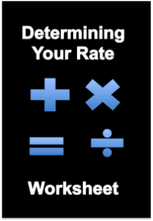 Our worksheet helps you determine your IT consulting rate. Every role is different. Sometimes you’re working a hot job, and other times you’re working remotely in a less sought after discipline. This variation impacts your rate, which is why you need to re-calculate it with each new contract position. Estimate your technical consulting rate by following the steps and filling in the blanks with your current rate information. Learn how telecommuting, part-time work and in demand skills affect your rate. With this worksheet, you won’t need to wonder if you’re asking for too much or too little. You’ll walk away with a ballpark figure you can be confident is fair.